The community area has a big pool (May-Sep), paddle tennis courts and a huge playground for the kids. The apartment is equipped with an elevator and private underground parking. We are speaking German, English, Spanish and French and will answer any request shortly. There is a local contact available that will take care of your very needs. We are a German couple living in Frankfurt. I love horse riding and Alex plays soccer in his free time. We both enjoy skiing/snowboarding in winter and kite surfing in summer. My husband has visited Zahara already as a kid and when we came here together, I instantly fell in love with this place with its long and broad white sandy beaches, enough wind to enjoy the kites most time of the year, the spanish hospitality and the terrific food. So we decided to buy something here to be able to enjoy it ourselves for several weeks a year, but also to share it with others who enjoy it as much as we do. We maintain our apartment in Zahara according to our own high standards and hope to share it with people who enjoy this place as much as we do. Spacious apartment with a beautiful roof top terrace were we enjoyed unforgettable sun sets. Perfect for a family of four like us, close to the beautiful beach. Perfect infrastructure with pool, beach equipment, a little supermarket and a fish shop were we bought every day fresh fish. The only downside from our point of view: To claim luxury the apartments really needs a little renovation, especially the bathrooms. Firtsly dealing with the owner and the caretaker to check in and out was very easy. An Englishman living in Spain deals with keys etc and it was very easy to arrange to meet him at the only petrol station in Zahara and be shown the way, the car parking, how everything works etc. The owner will give you his details in advance. I texted the day before and got a reply from hima nd then called him on the day when we were getting close. 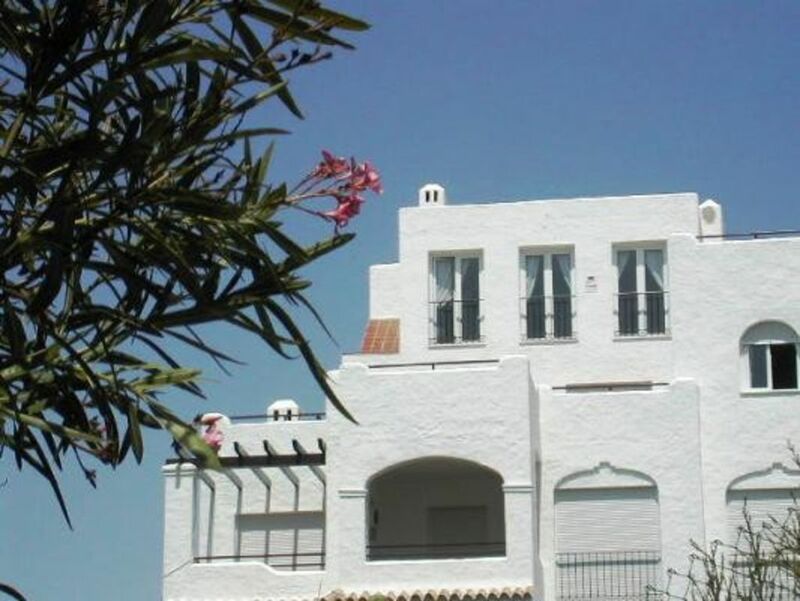 The appartment is about 1.5 miles from the centre of Zahara de los Atunes in the direction of Atlantera. It has stunning views over the beach and a superb terrace with lots of seating. We enjoyed walking into the 'village' for restaurants, shops, the small market etc. We stayed in November which is very quiet - this suited us as we don't like the crowds and had about 7 miles of beach to share with about 5 other people! However, do be aware that all of Atlanterra (swimming pools, shops etc) closes out of season. The village of Zahara has shops that do stay open - good supermarket and some restaurants; or if you want more the town of Barbate is only 9k away and has everything you would need. The appartment is very well equiped and very comfortable. The beds are excellent - memory foam matresses and a selection of pillows. Plenty of towels and T towels. The kitchen is as well equiped as mine back home with lots of utensils and saucepans etc. I was able to cook 'proper' meals like stews and oven items just as I would at home. It was particularly nice having a large fridge and freezer so that we could stock up for a week. I also used the washing machine twice and it was easy - bring your own washing powder/capsules. We happened to be at the appartment when the owner was also staying in Zahara and we met her briefly - she was very kind and gave us recommendations for restaurants and kitesurfing a little further down the coast. I highly recommend this appartment. It's a home-from-home. This fantastic apartment is set in Atlanterra, about 1k south of Zahara. Atlanterra has been a delight with its superb wide and long sandy beach, various beach bars and lovely restaurants. The apartment is spacious and very well equipped, the crown being its huge terrace with sea view. We have a had a wonderful holiday here and would return in a moment to both the apartment and Atlanterra. Watching the sun go down on the horizon from a beach bar with your feet in the sand and a drink in your hand will be very missed by our family! We are a family of 5, and we stayed here for 4 nights June 14-18, 2016. Stanley greeted us & took us to the apartment and showed us everything we needed to know. Upon arrival there were fruit, breads, meats, cheeses, wine & pastries welcoming us! The apartment was clean & spacious. My husband & I are very organized & thou rough people & we have discussed many times what we would provide for people if we had a rental property. This apartment was pretty close to exactly how we would have done it. Books/cd's/movies/spices/some goods/beach chairs/knee boards, etc! The washer/dryer/dishwasher worked great! The proximity to the beach was great! The ONLY bad thing was that the pool was locked & we had to climb the fence to use it! The view of the ocean was breathtaking! The owners even had brochures & suggestions for anything you needed or wanted! We do recommend this apartment! We had such a lovely time in Zahara de los Atunes even though the resort itself was very quiet at this time of year. We felt like we had the complex to ourselves. The apartement was furnished to top standard and had wonderful views of the sea. The pool was closed at this time of year but we did not miss it as our kids played and swam at the beach each day. The beach was just in front of the complex, less that 2 mins walk. The apartement had wifi and plenty of ourdoor space in which to take in the stunning sunsets each evening.Would really recommend this apartement to families. Dear Jennifer - thank you so much for your nice review. We are very happy that you could enjoy the place in the quieter month. We also love this time of the year. Hope to have you again soon! We have just returned from Zahara de los Atunes and we were very happy with this excellent apartment. The place was very spacious and had everything you could possibly need. It was very well equipped. The kitchen had everything you would have at home. It was like being at home inn terms of equipment, microwave, washing machine, dishwasher and even a tumble dryer in the outside cupboard. there was a BBQ and lots more. The beds were very comfortable which was a real bonus. Lounge furniture was also very comfy as was the excellent outdoor furniture. Stanley was the contact in Zahara and he was really good. He met us and took us around the apartment and he told us how to use the television. He was very pleasant and helpful as were the owners Iris and Alex. Iris was brilliant at getting back to us with our queries before we left UK. All in all a very lovely apartment. Really nothing to fault. Great views of sea and country and a very short walk to the beach. We will definitely go back and we would choose this apartment again without a doubt. As we were there in October a lot of restaurants were closed but we found a great tapas bar and restaurant in nearby Barbate, El Campero. Tapas were excellent and reasonable too. Go to this apartment, you will love it !!! Zahara de los Atunes is a fishing village on the Costa de la Luz, 30km north of Tarifa on the Atlantic coast. The village has a large selection of restaurants and bars. The beach stretches from Atlanterra to Barbate, a distance of over 12km. It is wide, bordered by dunes and carpeted with the most wonderful golden sand and is safe to swim. Accessible from Jerez, Gibraltar, Seville and Malaga airports. RYANAIR ARE FLYING STANSTED TO JEREZ, LESS THAN 1 HOUR TO ZAHARA. Other Activities: nearby Tarifa is famous for its kite- surfing and you can also take a ferry from Tarifa to Tangiers. Bike hire available nearby.